Ali was a typical toddler until she was diagnosed with Langerhans Cell Histiocytosis when she was just 20 months old. In 2010, her nanny noticed that her jaw looked slightly asymmetrical. Her pediatrician sent her for x-rays and her biopsy provided a diagnosis. She began chemotherapy treatment at Children’s National Medical Center in 2010. Alison has remained on active treatment since then. 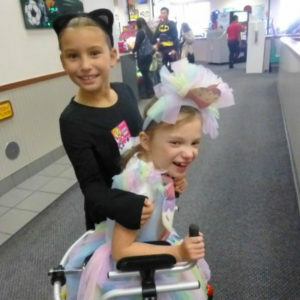 At age 3, she developed auto-immune complications, and her balance and motor skills were impacted. Hopefully, a cure for her disorder will be found some day. We are delighted that Alison is completing second grade, loves ballet, art, and being a Brownie, and especially reading. She is a super active little girl and is thrilled to be able to attend the JUST TRYAN IT race in Bethesda, MD and to root her sister Juliet on!